The first big thing is a Fatal Five-Way at Extreme Rules for the right to face Brock Lesnar whenever. Finn Balor, Seth Rollins, Bray Wyatt, Samoa Joe, and Roman Reigns are the competitors. Four of them faced off in two singles matches tonight, and the fifth is Samoa Joe, Raw's new evil Sami Zayn. Reigns beat Balor because Reigns. Rollins/Wyatt went to an inevitable Samoanterference DQ. We're back to sloppy singles matches between Shesaro and the Hardys. Jeff beat Sheamus, yay. Dean Ambrose and Miz had an energetic title match, but the DQ finish was clearly intended to set up an Extreme Rules rematch, put possibly not without a series of matches in between that gradually increase the stipulations. Not sure how to read that Miz-Angle segment, honestly. Similarly, an Extreme Rules rematch is in the works for Alexa Bliss and Bayley, and let's hope it's not a match that involves talking, because Bliss would straight up murder her. Like she did tonight. It turns out it's a Kendo Stick On A Pole match, which is either the best or worst thing ever. Sasha Banks jobbed to Alicia Fox, so this is definitely the darkest timeline. 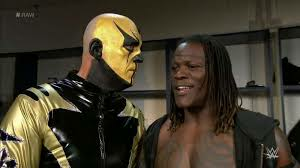 Goldust and Apollo Crews both turned heel this episode. In the case of the former, the crowd could barely manage a very anemic smark-ironic "Thank You Goldust" chant, and in the latter case, I'm not sure anyone noticed.